Hello guests. Please take a minute to sign up and join in the conversation. It's free, quick, and easy! Quite a bit of heat just below the surface. Moderate niño looks a good bet and strong niño might be a possibility still. We don't won't strong, it will keep us dried up? This past October's East Pacific Warm Water Volume anomaly was 6th highest on record, in moderate El Nino territory if you use ranked percentiles, and was about 1 standard deviation above average. Also worth mentioning it was only superseded by moderate or strong El Ninos (1997-98, 1982-83, 2015-16, 2002-03, & 1991-92). A weak or moderate central Pacific El Nino is the most likely outcome for this winter. Synopsis: El Niño is expected to form and continue through the Northern Hemisphere winter 2018-19 (~80% chance) and into spring (55-60% chance). ENSO-neutral continued during October, despite widespread above-average sea surface temperatures (SSTs) across the equatorial Pacific Ocean [Fig. 1]. All four Niño regions showed increased SST anomalies in October, with the latest weekly values near +1.0°C in the Niño-4, Niño-3.4 and Niño3 regions, and +0.2°C in the Niño-1+2 region [Fig. 2]. Positive subsurface temperature anomalies (averaged across 180°-100°W) also continued [Fig. 3], due to the persistence of above-average temperatures at depth across the eastern half of the equatorial Pacific Ocean [Fig. 4]. However, atmospheric convection remained slightly suppressed near the Date Line and over Indonesia [Fig. 5]. Low-level westerly wind anomalies were observed over the eastern Pacific during October, while weak upper-level westerly wind anomalies were present over the far western Pacific. The traditional and equatorial Southern Oscillation indices were near zero. Despite the above-average ocean temperatures across the equatorial Pacific Ocean, the overall coupled ocean-atmosphere system continued to reflect ENSO-neutral. The majority of models in the IRI/CPC plume predict a Niño3.4 index of +0.5°C or greater to continue through the rest of the fall and winter and into spring [Fig. 6]. The official forecast favors the formation of a weak El Niño, with the expectation that the atmospheric circulation will eventually couple to the anomalous equatorial Pacific warmth. In summary, El Niño is expected to form and continue through the Northern Hemisphere winter 2018-19 (~80% chance) and into spring (55-60% chance; click CPC/IRI consensus forecast for the chance of each outcome for each 3-month period). I just updated my Ensemble Oceanic NINO Index (ENS ONI) to October 2018. If we can hold this ASO value (in general) thru the rest of the winter, this will be the first tri-monthly period in El Nino territory. OHCs usually peak before SSTs and often in Oct. Since Oct, it has cooled back slightly. Based on all of this, I predict that Oct's +1.58 will turn out to be the peak monthly OHC. The last weekly 3.4 SST was considerably cooler at +0.8 after a prior week peak of +1.2. Based on history, there's a pretty high chance that the peak weekly for this fall/winter will end up being no warmer than +1.6, which would mean no strong Nino for the warmest trimonthly. If we were to get up to a +1.6 weekly peak, the corresponding trimonthly peak would likely be only in the +1.2 to +1.3 range. If the +1.2 peak were to hold, the trimonthly peak could end up only in the high end weak to low end moderate Nino range near +0.9 to +1.0. Perhaps this is a sign that the Nino peak will end up only weak? Any thoughts? Is that a concern ... I'm not connecting the dots. Well, I think we'll end up with at least a weak El Nino per tri-monthlies, regardless. I'm trying to see if others more knowledgeable about OLR centered around the dateline (as the table is) feel any special dots need connecting. Nino 3.4 is down to 0.7 C.
It’s looking more and more likely that El Niño will peak near the border of weak/moderate. Whereas the very warm subsurface peak would appear to support a solid moderate, something seems to be holding it back. Is that due to there still being -AAM, which is normally associated with La Niña? Is it related to the still +OLR near the dateline as of October, which is also usually associated more with La Nina. Come to think about it, are the -AAM and +OLR directly related? Anyway, weak to low end moderate Niño peaks, when combined with a -NAO and +PDO, have historically lead to some of the coldest SE US winters on record similar to what JB and the Pioneer model is forecasting. Then again, I don’t know if any of these very cold weak Niño winters had a -AAM at least early on. Does anyone have a link to AAM monthly history? TIA as I can’t find it. **11/25 Edit: Although right about the Oct +OLR, I was wrong in thinking there was still a -AAM as that actually switched to +AAM in Oct and is now strongly +AAM. Nino 3.4 warmed a whopping 0.6 to +1.3! Unless I missed one, this ties the largest warming in one week back to 1990! Nino 3.4 cooled back very slightly from +1.3 to 1.2 in today’s weekly update. Nino 3.4 cooled in Mon's update from +1.2 to +1.0. Tidbits and buoy map agree it has cooled. Maybe the 1.3 of 2 weeks back will end up as the weekly peak. If so, the trimonthly peak will likely be only slightly warmer than +1.0, if at all. So, borderline weak/moderate peak would be the case. Also, the buoys look more west based now. 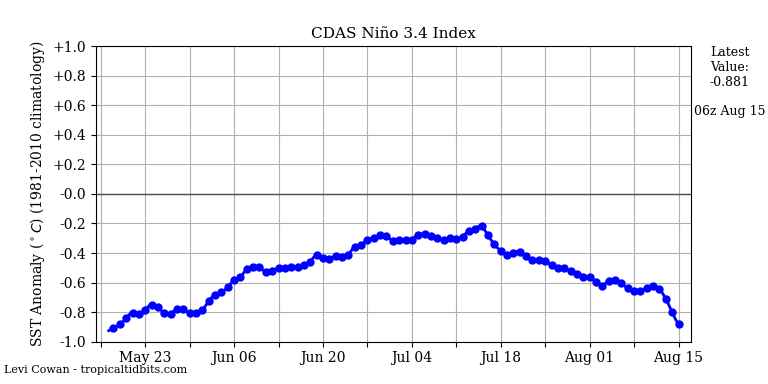 Niño 3.4 warmed very slightly to +1.1. It looks increasingly likely that the +1.3 of a few weeks ago will be the weekly peak when considering the OHC being well below the Oct high and the persistent +SOI of the last few weeks. Also, it looks the most west based yet. It is never a bad thing to have a borderline weak/moderate west based Niño peak following La Niña for SE winter prospects. We’ll see what cards the SE is dealt in Jan-mid March but I remain optimistic for an interesting pattern to return by no later than mid Jan. I’m guessing it will start pretty early in Jan. I’m saying this despite the surpringly warm new Jamstec DJF outlook. Nino 3.4 is at +0.4C. Nino 3.4 is down to +0.3 C.
Nino 3.4 is up to +0.4 C.
Check out the latest weekly: 3.4 warmed a whopping 0.4 to +1.1!! Sure looks like we are headed for a summer/fall nino? Noticed this when checking out the SST maps on tidbits. It appears there is some strong cooling ongoing in the EPAC, is this a data error or legit? Here's the 7 day SST change. The 1 + 2 region has showed an overall trend down. I'm wondering if these are legit and if so what effect it could have on whether we see a full blown Nino developing or if it fades out over the next few months? Thoughts? Haven't really dug into things as I've had a lot going on lately with work. It'll likely have little-if any effect whatsoever, the NINO 1-2 region SSTAs are extremely noisy for one and two this is expected given where the far EP lies in KW phase space. Immediately in advance of a downwelling KW there's usually anomalous upwelling & that's what's currently affecting this area. SSTAs will dramatically rise in the NINO 1-2 region within the next few-several weeks once this downwelling KW reaches South America. It just seems like so far the Nino isn't really making much progress despite the strong WWB seen recently. The 1 + 2 region is in a downtrend since January, 4 is back down from the spike to levels seen the past few months, region 3 has dropped quite a bit and 3.4 is sort of in a holding pattern after the brief spike we saw. And the overall 7 day change shows significant cooling over almost the entire region from the EPAC to CPAC. Like I said though I don't typically follow Nino/Nina stuff all that closely and haven't done any digging into things, just on the surface so far it seems like the SST's as a whole are not making much if any progress at least based on the Tidbits maps... at the same time the subsurface heat anomalies are quite impressive and might indicate the potential for a mod to strong Nino forming too. The recent cooling is related to subseasonal variability, the massive warming spike following the month-long WWB is not however and is a response to a lower frequency Kelvin Wave propagating across the Pacific. We're already virtually in a weak El Nino atm as most international agencies have already noted, virtually no progress beyond this point would still result in an El Nino this summer which is a detriment to the Atlantic hurricane season, especially when coupled w/ an active NE Pacific. Yeah the warming spike due to the WWB is pretty obvious but since then things have cooled off to about where they were previously. If we are going to get a mod to strong Nino we are going to need more of a sustained warming to take place rather than a brief spike that cools down to what temps were before the WWB (or even cooler in some regions). I agree that we are in a weak Nino as well but whether that sustains, strengthens or weakens some is still not clear to me. I've heard a lot of chatter about a mod to strong Nino developing over the coming months on twitter and other sources, it'll be interesting to see if that does happen. Nino 3.4 is at 0.9 C.
Not much in the way of WWB's to work with in the near future either. The subsurface cooling is shown in this graphic pretty well, this region was much warmer a few weeks ago. The Triton graphic is likely skewed too cold but it largely agrees with the one posted above with the general theme of colder subsurface SST's spreading and taking over in contrast with the warmer subsurface we saw last year at this time. The CFSv2 is showing a decline into neutral territory. Overall I still remain quite skeptical of a full blown mod to strong Nino developing this year. In fact I myself am leaning towards the idea of a transition into a warmish neutral state by June or July, something in the .2 to .4C range. Obviously we are still in the spring barrier where things can change quickly but what I'm seeing so far leads me to believe we might have a neutral or weak Nina this upcoming winter. Many hurricane season outlooks are basing their predictions off an El Nino lasting through the peak of the season. If it actually weakens to neutral before then that could change things somewhat.. Still a long ways to go.